New limited collection! 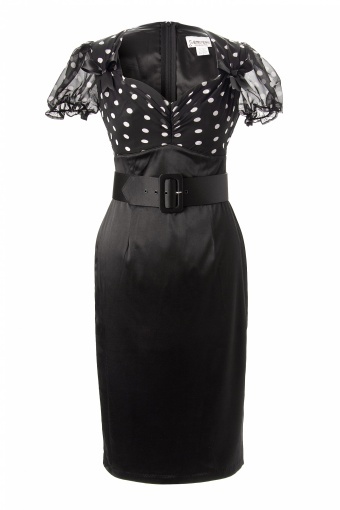 The L'Amour Dress in Black Satin with Doth Chiffon Overlay from Micheline Pitt by Deadly Dames - Pinup Couture is named for Love for it embodies many features girls love. The bust of the dress is fully seamed, lined, and constructed to support one’s bust to the point where a bra is not always necessary. 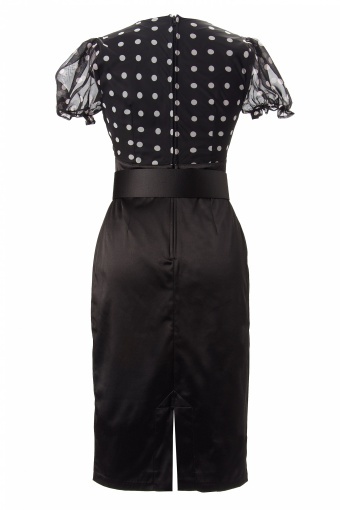 The cute black dot chiffon overlay is gathered on top to give it a soft and feminine look. The sleeves are also chiffon with a soft twill elastic to allow for multiple arm sizes. The dress would not be complete without the black satin bows. The L’Amour also comes with a removable black satin belt. The skirt is made of Shakira satin and is doubled up in the same fabric to give a flattering silhouette. Available in 3 different styles! Bridget Maasland wore our dress on Shownieuws SBS6 TV!